We Love our Town | Sprezzatura, Y'all! 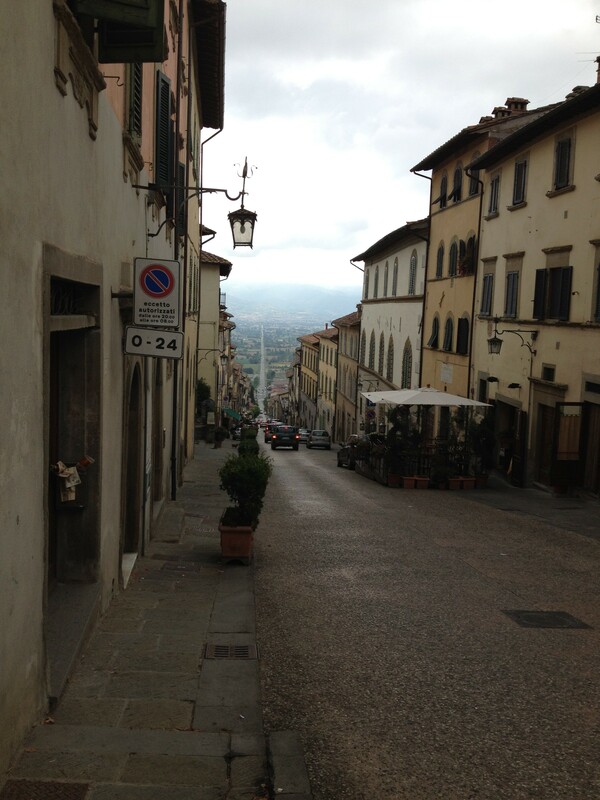 We drove to Sansepolcro this morning to get a few odds and ends – a colander, some wooden spoons, some Vick’s vapor rub – and had a very pleasant drive. It’s about a 10 minute drive to Sansepolcro. 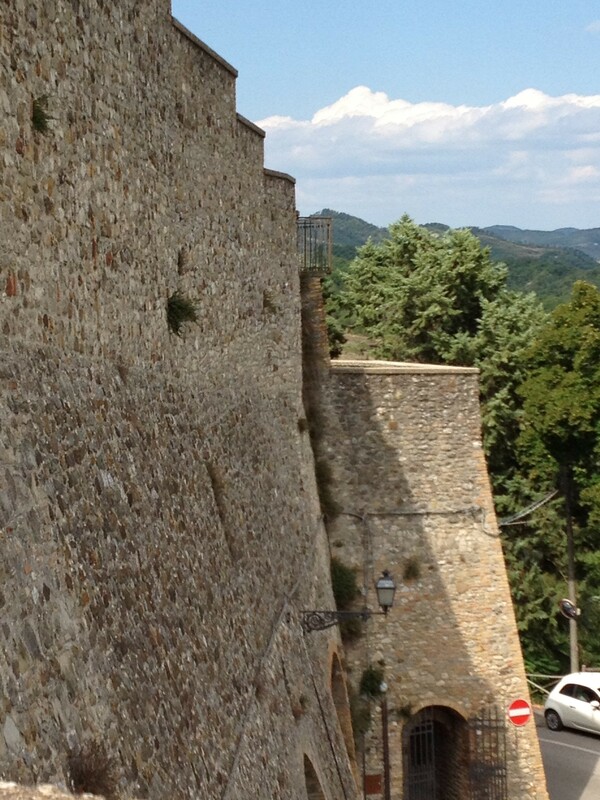 Anghiari is split by a long straight road that slices the Tiber valley below in half and goes right into Sansepolcro. It began as an ancient road that connected the two towns and in the last century got paved and lines drawn on it. The valley is where the Battle of Anghiari took place back in 1440. There’s a famous painting by Leonardo depicting the battle which has been mysteriously lost over the years. There’s an effort to try and uncover it from its suspected hiding place inside the Palazzo Vecchio in Florence, but for now its whereabouts remain unknown. Standing on the old city walls and looking out over the valley you can imagine that, except for the few paved roads and modern buildings (some from the 1860’s, some from the 1960’s), it looks much the same way now as it did then. The battle was between Milan and Florence and Florence soundly defeated Milan, adding the area around Anghiari to its holdings. The legend around town is that the battle was so one-sided that the only casualty was a poor soul who lost his life to influenza. We keep discovering things about Anghiari. The palazzo that we live next to, the Palazzo Taglieschi, was once surrounded by a moat. The streets around our apartment were once trenches filled with water to keep certain people out and certain people in. Is that the medieval equivalent of a gated community? 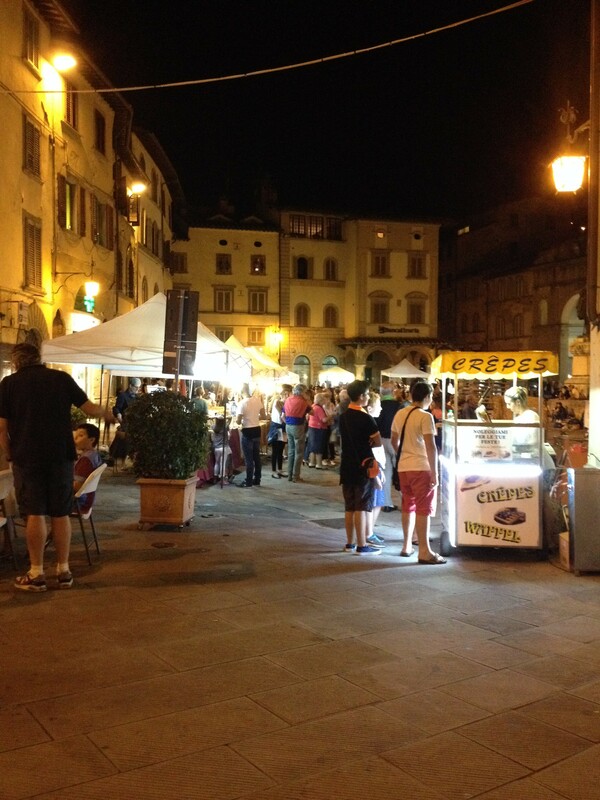 As small as Anghiari is, it has layers of history and every day we learn something new. By the time we leave (now less than six months from now), we still won’t know everything about this place, but we’ll know much more. And we’ll love it all the more. Every Wednesday night in August they have live music all over town. Stages are set up, large and small, in every piazza, some just on little corners, and bands start playing about 8:30 or so and go until whenever. It’s called Mercoledi in Anghiari (Wednesday in Anghiari). It’s a wonderful way to usher out summer and take advantage of the cool evenings that come here in mid and late August. It’s a party on the streets every Wednesday and it’s part of what makes this place so special. You can get a glass of wine or a digestive and listen to this band for a bit, then wander over to the next piazza and catch some of that band, and spend your whole evening strolling through a musical smorgasbord in a medieval city. Last week there was a parade of singers dressed in Renaissance clothes filing into the main piazza. Last night was the last one and it was very sad that it was over. But if I know anything about Italy, it will be replaced by something else equally fun and entertaining. There’s always a celebration for something in Italy. We’ve been to the truffle blessing, in September in Monterchi, a neighboring town, there’s a polenta blessing which we won’t miss, a couple of days ago we passed a pecora blessing (pecora is sheep, so I’m not sure exactly what was going on there). Something is always getting blessed or celebrated here. Yesterday, on the advice of our older plant-watering neighbor, we went to Montone and attended the “La donazione della Santa Spina”, the gift of the holy thorn. The legend is that in 1473 Carlo Fortebracci of Montone was off fighting for the Republic of Venice and did such a good job that he was presented with a thorn from the crown of Jesus Christ (the Santa Spina) where it rests today (safely out of view of the public) in a beautiful silver shrine kept by the nuns of the Sant’ Agnese convent. Every year they celebrate the arrival of the thorn by having a week-long festival that is capped by a reenactment of the moment when the thorn made its way to Montone. All the children and a good many of the adults of the town dress in beautiful costumes for this ceremony. We missed the ceremony because our dear neighbor, who doesn’t speak any English, told us that the “festa” was doppo pranza (after lunch). We got there at 3:15ish and it didn’t start until 5:30 “or so” according to the one person in Montone I found who did speak a little English. 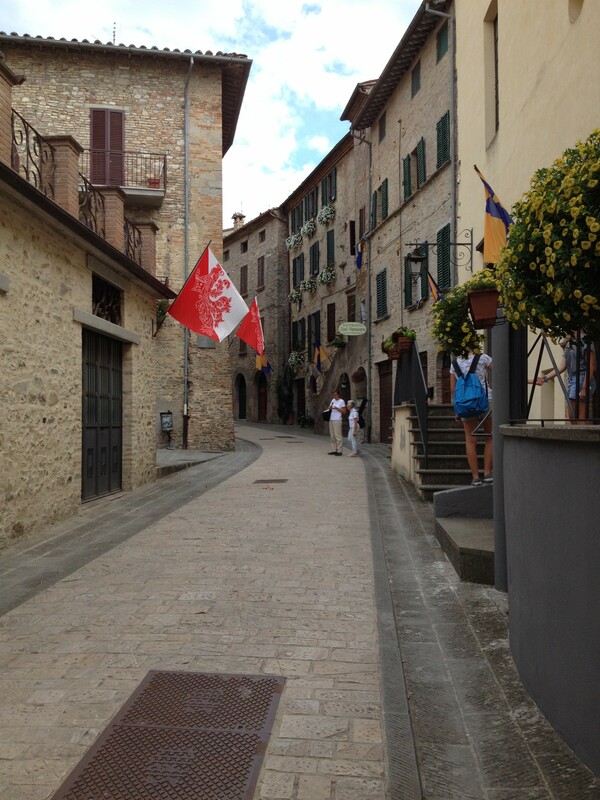 While we really wanted to see it, spending two hours in Montone was just not possible. It’s a beautiful place but tiny and we just couldn’t figure out what to do for two hours. And forget going somewhere else to kill some time. 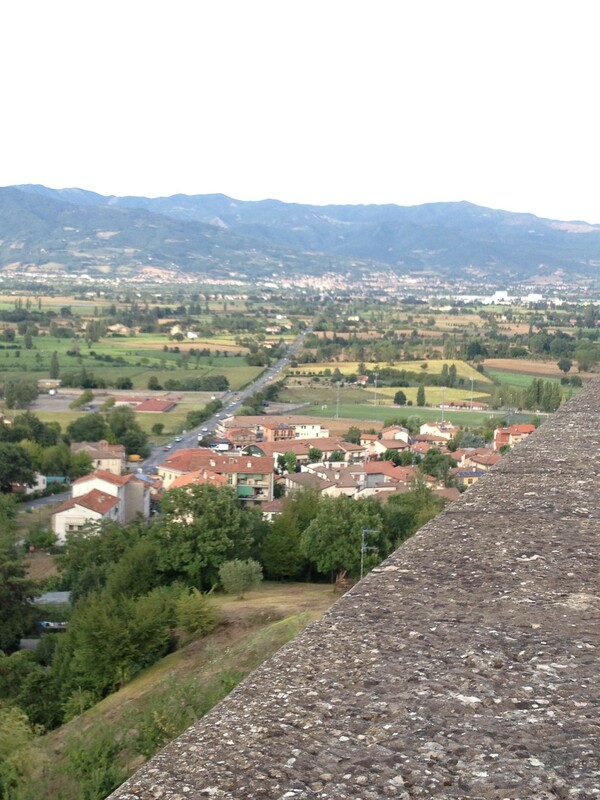 Montone is very remote and there’s really nothing around it for miles and miles. We’ll probably regret not staying, I already do a little, but we’re just not there yet. Soon I hope we get to the point where two hours to wait on the reenactment of the arrival of the thorn from the crown of Christ won’t be too long, but for now we’re still too American to see the reward in that. Hey — I remember going to Mentone with you guys. It is small, but beautiful. There is supposed to be a great restaurant there. Maybe a NY Times article on the town could be resurrected…I faintly remember. It is beautiful. We’ll go back for sure. There are many restaurants there (surprise!). I thought we went there with y’all – I just couldn’t remember any particulars.